A stupendous hodge-podge of colors, shapes and flavors are a reminder of how unexpectedly sensational diversity can be. 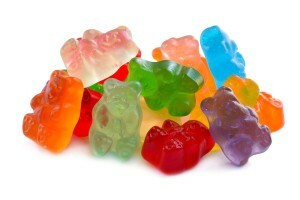 Our fruit gummies are a feast for the eyes and a delight for the tastebuds. Their slightly squishy texture may bring out the kid in you making it impossible not to squeeze these sticky little treats before popping them into your mouth. Corn Syrup, Beet Sugar, Gelatin, Sorbitol From Fruits & Vegetables, Citric Acid, FD&C (Yellow #5, Yellow #6, Red #40, Blue #2 and Blue #1), Natural and Artificial Flavors, Vegetables Oil, and Carnauba Wax. One bag contains about 70-80 pieces. My son’s favorite. And you get a little bit of everything in one bag! Great assortment of a few different types of fruit gummies. Soft and chewy. You can tell they are fresh! We really wanted to love these since we’re obsessed with gummy candies but both me and my wife didn’t care for the taste of the gummy rings. The raspberries are amazing though!